Plan to attend this gathering on February 6, 7-9 p.m. at Union Congregational United Church of Christ, 3700 Alabama Ave. This is an upbeat, arts-driven, solution-focused event that tackles the goal of ending poverty by 2020. Beginning at 7 p.m. there will be an open house with information from local agencies. At 7:30 p.m., revered Minnesota poet and author Julia K. Dinsmore and Minnesota Champion Youth Poet Tottiana Adams will perform spoken word. A free-will offering will be collected for the agencies represented. If you have questions call Brenda Clarno, 952-929- 8566. Lenox Foundation Board is hosting a food collection for STEP, the St. Louis Park Emergency Program. Between February 8 and 12th drop off food items or cash at Lenox Community Center to help out the 600 local families who receive help from STEP during a month. Drop off hours are 8 a.m. – 8 p.m. Lenox Community Center is located at 6715 Minnetonka Blvd. Have you ever wondered about what police officers do and how they carry out their duties? Would you like to meet your local officers? Adults who live or work in St. Louis Park are invited to learn about the operations of the Police Department during the six-week Citizen’s Police Academy Program. The program runs on Thursdays beginning on February 18 from 6:30 – 9:30 p.m. and ends Sat., March 27, 9 a.m. – 1 p.m. with lunch and graduation. For more information or to register email the Police Department. Space is limited, so don’t delay. 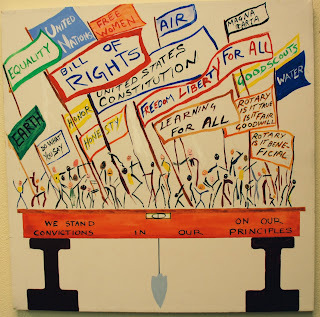 Breck Fleeson, The Rotary Club of St. Louis Park created the painting about about the asset Integrity.